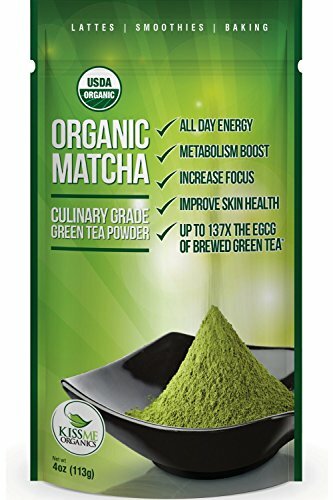 Kiss Me Organics’ top quality Culinary Matcha powder provides 4 to 6 hours of mild steady energy as it acts as both a stimulant and a relaxant, ideal for focusing on whatever the day throws your way. Our Culinary Grade Matcha is harvested in Japan, made from 100% certified organic ingredients. Only the finest tea leaves are chosen, which are then ground into our beautiful matcha powder. Calorie-burning booster. Consuming Matcha green tea can increase thermogenesis (the rate at which our body burns calories) by 30 to 50 percent. Ideal for culinary purposes. Can be whipped into a latte, or added to your smoothies, sauces, and baked goods. Helps maintain a healthy metabolism. It also helps reduce cravings, and naturally supports weight loss goals. Contains the potent amino acid L-Theanine. This helps reduce stress levels, while enhancing mood, energy and improving memory. *Contains caffeine: All matcha contains a combination of caffeine and L-Theanine, which provides a calm, long-lasting energy boost. We package our Culinary Matcha in BPA-free packaging with a resealable zipper pouch. Each package is nitrogen-flushed to ensure maximize freshness and potency. Product has a naturally bitter flavor due to the high levels of anitoxidants. You may want to use a natural sweetener. The color you see is an unadulterated and healthy hue of green. Matcha mixes well in water but does not completely dissolve. Expect some settling. Consuming a lot of matcha may lead to an upset stomach. We recommend starting with a small dose of 1/4 teaspoon and gradually working your way up until you feel the desired effect of calm, focused energy. Package size 4oz / 114g. Recommended serving size: 3g or 1 teaspoon. Contains 137x the antioxidants of brewed green tea. 1 gram of Matcha contains 30% recommended daily dose of Manganese, a powerful antioxidant that improves skin, bones, and several other systems.